Valentine Singers were in nocturnal mood at Barnados Church on Saturday with a programme of music and words focused around the theme of night. 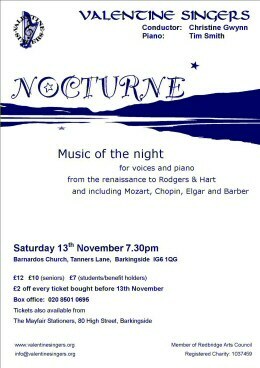 Nocturne included a cappella and accompanied vocal music, piano solos, and readings by members of the choir. The varied items explored aspects of the night – its atmosphere, sounds and colours – as well as some of its more illicit activities, as in Kipling’s familiar poem, A Smuggler’s Song, expressively read by Pat Pretious. Musical director Christine Gwynn drew well-controlled performances out of her singers, particularly with the lush harmonies of part songs by Elgar, Barnby and Sullivan, where tuning and blend were at their best. A set of six vocal Nocturnes by Mozart showed off the choir’s potential for drama, charting the phases of a passionate love affair with plenty of vocal colour and dynamic range, as well as attention to the Italian diction, which was commendably clear. This was also notable in the choir’s delightful rendering of Vecchi’s Fa una canzona, which opened the concert. Soprano Clare Gailans and pianist Tim Smith gave a spacious and compelling performance of Britten’s Nocturne from On this Island. And, for me, the Highlight of a pleasing evening’s entertainment was Smith’s eloquent account of Debussy’s Clair de Lune. It transported me from a hard pew and a damp chilly Ilford into the ravishing French moonlight. The next ENO Baylis 'Know the Show' event is due to take place next January, although a date has not yet been fixed. To get an idea of the flavour of these events there are pictures at http://www.flickr.com/photos/eno-baylis/sets/72157624811202206/ and videos at http://www.youtube.com/englishnationalopera of the recent event in August. Click on the 'Know the Show August 2010' icon to see videos of the opera choruses we rehearsed and of the parallel events for children. The choruses were from Gounod Faust, Handel Radamisto and Coronation Anthems , Puccini La Boheme and Madame Butterfly, and Mozart Don Giovanni. We were led by Richard Frostick (free-lance music animateur) and Martin Fitzpatrick (ENO head of music) with Ben Frost at the piano. The ENO is about to introduce two schemes that will allow adults to attend specific opera performances whilst their children/grandchildren etc. are otherwise entertained. 'Opera Tots' is for pre-school children aged 6 months to 4 years in a professional cheche, and 'Opera Stars' is a fun introduction to opera for those aged 7 to 12. There was also some talk of a 'Community Choir' being set up by ENO Baylis. You can find information about all the ENO's participatory events at http://www.eno.org/explore. Upon his eightieth birthday ! on this your four-score birthday. for wisdom and great kindness. You’re our great celebrity ! From there you have ascended. in giving you your first break ! you have reached such heights sublime ! and gladly sing your praises. of you, its founder member. that you must our president be ! In most seasons the ENO Baylis programme runs a 'Know the Show' event, for adult non-professional singers, providing an opportunity to work with members of the ENO music staff and learn music from the ENO's repertoire. For the Autum 2010 season a 2-day event is taking place at Cecil Sharp House (just North of Regents Park) on Thursday 26th and Friday 27th August, 10am to 4.15pm. There is a parallel event for children aged 7 to 12. I have taken part in several 'Know the Show' events, and can thoroughly recommend them; the music staff are brilliant, and usually members of the ENO chorus are present to sing with the sections. Tickets can only be booked at the Box Office or by phone. "We want to thank you for a wonderful concert this evening. 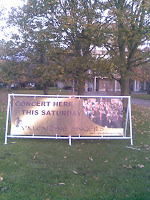 The choir gave us a lovely performance under your baton, and you got the very best from the soloists and the orchestra. Tim's majestic playing of the Piano concerto was thrilling." 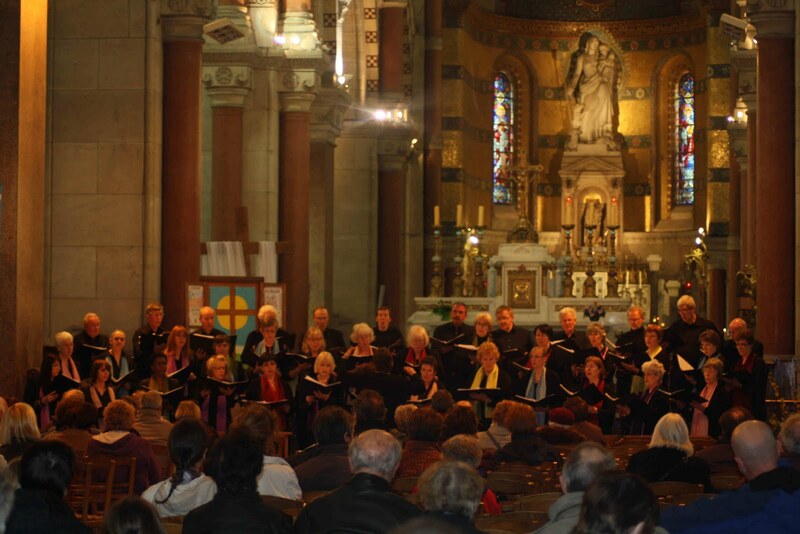 "I thought it went really well on the night - the choir did a great performance!" "A real pleasure to work with you "
"It was a lovely concert. 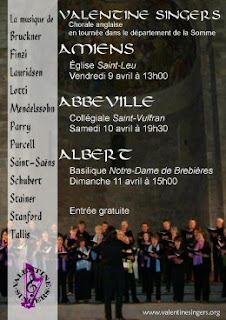 Choir and soloists good too. Nice to work with you again"
"Thanks again for a wonderful experience yesterday evening, I thoroughly enjoyed being part of it." 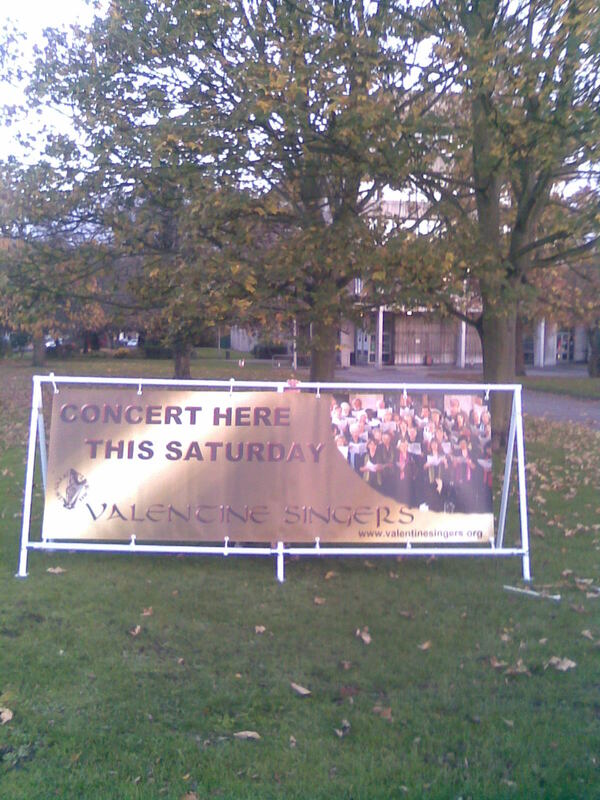 "Thanks to you for a great experience on Saturday....the concerto was sparkling"
Its the 'confessore' bit that puzzles me. My basic Latin tells me this is one word for priest and I fully understand that up until the time of Mozart and Pope Benedict 14th, Vespers would have been sung exclusively by those ordained. So, in the light of the relaxation by Benedict and Archbishop Colloredo of Vienna, to allow secularisation of some religious music, would Mozart ascribe this work as being that of 'a priest'? I've not been able to track this down in any reference book, but perhaps there's someone out there that does know?? As for the rest of the Latin text - I can manage to follow most of Psalms 110-113 and part 117, and of course the Magnificat - but if anyone does have a definitive translation it might be helpful to further understand the text we're singing. Valentine Singers made their debut performance in the Clore Ballroom of the Royal Festival Hall on Sunday 2nd May, performing a mixture of a cappella pieces plus Shearing's Songs and Sonnets accompanied by Tim Smith (piano) and Paul Bartels (bass). 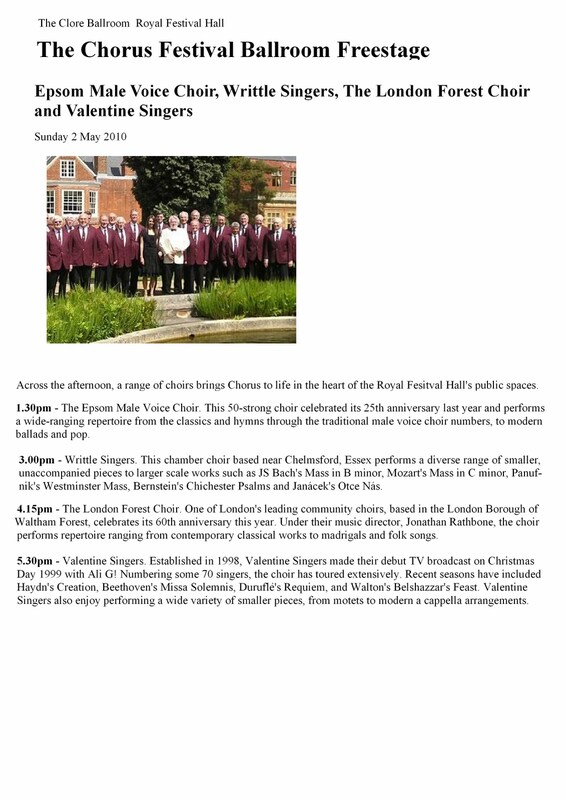 This is a version of the Royal Festival Hall page with details of the choirs singing at the RFH on 2nd May. It is a .jpg file and should be copyable and enlargeable. See http://www.southbankcentre.co.uk/find/festivals-series/chorus for original, as mentioned in Christine's e-mail. Shock-horror; charts on Radio 3! Radio 3 has started broadcasting a 'pure' classical music top ten, based on releases made over the last 2 years, in a couple of it's programmes. Of interest to us is that Mahler's symphony no. 2 is currently at number 10, and Rob Cowan remarked "But there is something very special at number 10. If you want to hear music that has the power to transform lives, then listen to this". To see an article by Elizabeth Mahoney search for 'Radio head' on www.guardian.co.uk, with date of 14th April. THE VALENTINE Singers, under their conductor Christine Gwynn, gave a delightful programme of Songs and Sonnets on Saturday at Barnardo's Church, Barkingside. The packed audience was promised music and poetry "from robust drinking chorus to tender love Iyric, from spoken words to songs without words". The performance of the opening Tourdion, a popular dance from 1530 by Pierre Attaingnant, set feet tapping with its colourful drone effects, lively rhythms and fine blend of voices. Central to this half of the programme were two sets of pieces by Mendelssohn. Five of his Chorlieder were sung, with the men of the choir in particular sounding full, rich and exciting. It was unusual and interesting to have the translations of the poetry involved spoken before the actual performances. Tim Smith, the choir's expert accompanist, played several of the songs without words with his customary technical brilliance and fine musicianship. The second half of the evening opened with a splendid and novel arrangement of Schubert's To Sylvia, followed by a most enjoyable Sweet Tea by Charles Beale. We were then treated to Songs and Sonnets from Shakespeare, a series of pieces for choir, jazz piano and bass, composed by the legendary blind jazz pianist, George Shearing. This mix of witty and tender music, with its fresh and youthful sound, is a homage to two remarkable Englishmen, and it became very evident just how much the Valentine Singers enjoyed these part songs. Bass player Paul Bartels joined pianist Tim Smith. During the evening, there were many contributions from within the choir providing narration and readings, although the acoustics made difficulty for some members of the audience to hear clearly. Tim Smith performed the famous Listz Liebestraum early on in the programme, and later, two of the Gershwin song transcriptions for piano were superbly played. Christine Gwynn expertly guided this excellent choir throughout. Many people asked about Paul's amazing bass on Saturday. Find out more here! The first four symphonies of Gustav Mahler are extremely personal documents in which he speaks about his relations with the human and natural world around him, his God and his ultimate spiritual happiness. As a result they seem to grow from one another psychologically and spiritually, rather than stylistically or technically. In the creative process words were very important to Mahler. "When I conceive a great musical organism I invariably arrrive at a point where I feel compelled to call on the help of words as a carrier of my musical idea." he once said. In the First Symphony he found inspiration in his own verses for his song cycle "The Songs of a Wayfarer". Four years later he discovered the collection of traditional verses called "Das Knaben Wunderhorn" (Youth's magic Horn) which were remarkably similar in atmosphere and language to his own poetry. This became the basis for his "Wunderhorn" songs and his 2nd, 3rd and 4th symphonies, all of which employ the human voice and have as focal points, texts from "Wunderhorn". The Second Symphony written between 1887 and 1894 uses in addition Friederich Klopstock's hymn "Auferstehung" (Resurrection). There are five movements, the first three purely instrumental. The fourth features a contralto soloist who reappears in the final movement along with a soprano soloist and a four part mixed choir. 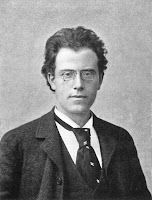 Mahler himself conducted the first performance of the complete work, in Berlin, on December 13th 1895. Much is known about the work from Mahler's own letters and 'programme' notes. His 'programme' notes and titles for each movement of all his first three symphonies were later removed by himself to allow everyone to approach the works without preconceived ideas of the content of each work. The 'programmes' were only abstract notions of the ideas from which the music sprang. However audiences who had seen them insisted on regarding them as detailed programmes similar to those being worked on at the time by Richard Strauss. What was worse was that musical critics saw them as indicative of Mahler being unable to compose music which could stand on its own. "We are standing beside the coffin of one dearly loved. For the last time his battles, his sufferings and his purpose pass through the mind. . . . . Released from the insignificant distractions of ordinary life our hearts are seized by an awesomely solemn voice. What next? it says. What is life and what is death? Do we have any continuous existence? Is it all a hollow dream, or does our life , now and after death, have meaning? If we are to continue living we must answer this question." ("I give this answer in the last movement.") The sense of conflict is reflected musically in the violent contrast of the main theme - an extended funeral march - and a lyrical second subject and in their tonalities (C minor/E major). In the development of the march a reference to the plainsong "Dies irae" emerges, looking forward to the march within the finale. "Remembering the past. A moment of bliss from the dead hero's life. A mournful memory of youthfulness and lost innocence". The movement seems to look back musically to the minuet of the classical symphony. The gracious Landler waltz theme has a decidedly Schubertian flavour. "The spirit of disbelief and denial has taken possession of the hero. Looking at the turmoil of life's superficiality he loses the clear vision of childhood and the firm footing which only Love gives. He despairs of himself and God." "Life appears senseless. . .and like a dreadful nightmare." " Disgust strikes him and drives him into an outburst of despair." For this scherzo Mahler uses the theme of his song from "Das Knaben Wunderhorn" which describes St. Anthony of Padua's sermon to the fishes. The irony of that situation in which the saint vainly tries to convert the fish - to stop pike stealing and carp gorging - has obvious application to the human condition. "The stirring voice of the simple faith sounds in our ears - 'I am of God and will return to God'. " The contralto's words are from the same 'Urlicht' (Primal Light) poem also from "Das Knaben Wunderhorn". "We are faced again with terrible questions. A voice is heard crying aloud. The end of all life has come . . . the Day of Judgement has come . . the earth trembles, the graves open, the dead rise and march, the great and the humble. . .the trumpet sounds. . . in the silence a nightingale sings like the last echo of life on earth. . .a choir of saints sings "Thou shalt arise". And behold there is no judgement - there are no sinners, no righteous, no great, no humble. An overwhelming Love shines. We know and are." For the song of the saints Mahler extends Auferstehung with words of his own. In the final march he uses the "Dies irae" which was hinted in the first movement. It is complete. Man is in the deepest misery! Man is in the deepest suffering! Ah, how I wish I were in heaven"
I came from God and will return to God! He will light my way to eternal life!. My body after a short rest! Will be given to you by Him who called you back. To be reborn you were sown. Everything you have loved and striven for. You have not lived and suffered in vain! Everything that lives must die! And everything that dies will be reborn! O suffering, all powerful suffering! Now I have escaped you! To the light no eye has seen! My heart, you shall come back to life! Great composer though Shearer might be, his knowledge of Shakespeare leaves something to be desired! The first song in ‘songs and sonnets’ isn’t by the Bard at all; it’s a hybrid of two poems. The first part (up to bar 60) is most of ‘The passionate shepherd to his love’ by Christopher Marlowe. Marlowe was a poet and playwright who was a contemporary of Shakespeare and might have rivalled him had he not got himself killed in a tavern brawl following a disagreement over who was to pay for the drinks. Walter Raleigh (the chap who put his coat over a puddle for Queen Elizabeth) wrote a reply to Marlowe’s idealised picture of rural life. In Raleigh’s poem the maid basically tells the shepherd to push off; she doesn’t think much of his presents as most of them will fade and decay and she’s not sure you can trust shepherds anyway! The first verse of this poem gave Shearer the end of our song. So in order to be true to the spirit of the original the choir (or the ladies at least) should sing from bar 61 with eyebrows raised and a kind of ‘am I bovvered’ expression to show what the maid really thought of the shepherd’s offer…. Pugging tooth – doesn’t seem to mean anything at all, at least all the sources I checked said it was unclear but probably rude! Sean O'Byrne kindly gave me a copy of this photo. Pat was presented with the bouquet at our autumn concert after she announced her retirement from the choir after many many years.